I really wish I had a good reason for why I’ve been away since April. But, uhm, you see, thing is, uhh… well, I’ve got nothing. Not a new flame, not a new job, no new passport stamps, nothing. I’ve been here, doin’ my thang, which apparently didn’t include this, and really, for no other reason than I just haven’t been motivated. That happens, right? You get it.You didn’t even notice so really, it’s ok.
Glad we sorted that out, then. But now, you see, now I’m back, because if there’s anyone who could bring me back to my humble little bloggity blog, it’s Dominique Ansel and his always-crazy-delicious bakery creations, the most recent to hit my mouth, the frozen s’more. 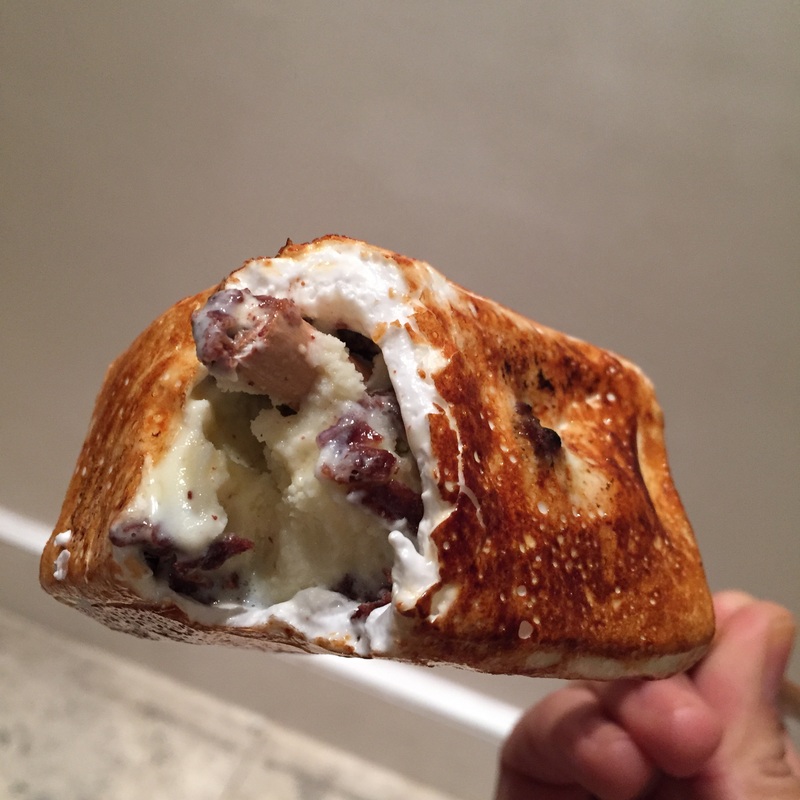 The frozen s’more is a hunk of vanilla custard ice cream, coated in chocolate, all inside a fat marshmallow coating of deliciousness that then gets the blow torch treatment to oh-so-perfectly char and caramelize the outside. 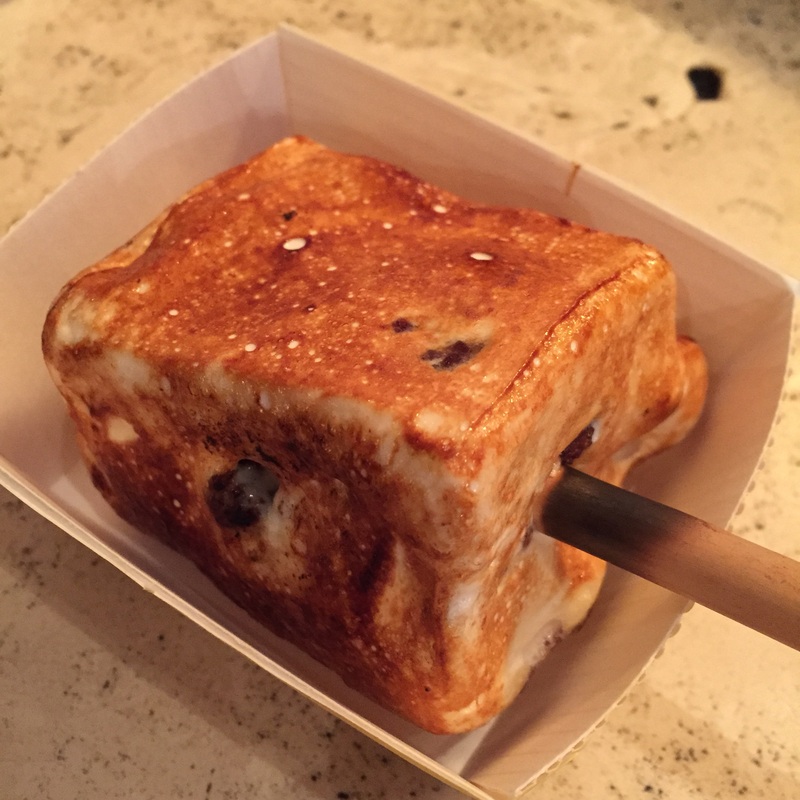 It’s even served on a long wooden stick (alla campfire marshmallows) for extra fun eating. You bite into this thing and the outside is warm and gooey while the inside oozes chocolate and the very core of it retains the creamy, cold ice cream. I never really thought s’mores were something that needed to be improved but dammit if DA didn’t go and do exactly that. They already had the great blend of textures and flavors going on for them and now he went and added a cool, creamy center? Mind. Blown. And perfect for these muggy summer days (when my brain basically shuts down anyway)! This entry was posted in Sweet stuff and tagged chocolate, Dominique Ansel Bakery, frozen s'mores, marshmallows, s'mores, SoHo, vanilla custard ice cream. Bookmark the permalink. Happy that you are back..you can have my share of the world’s chocolate as I am allergic. Oh my!! An allergy to chocolate would shatter my heart! Everything is improved with the application of creamy custard ice cream. And the right liquor for that matter. Enter the Frosty Drunken S’more someday… Also: “Write something here” =D. Thanks for the highlights failure flashback Angie. Bahahaha jesus, what would Mrs. Feldman say?